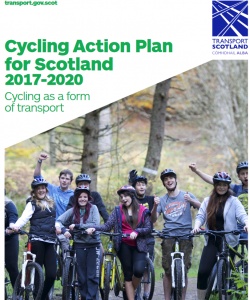 The Scottish Government’s third Cycling Action Plan for Scotland (2017-2020) follows the pattern of CAPS1 and CAPS2 – a collection of increasingly useful & positive initiatives, but not an evidence-based, costed and funded programme to achieve its “unshakeable” commitment to 10% of all trips being by bike in 2020. We could take this response seriously if the government had itself produced an evidence-based argument as to the level of funding required to achieve the 2020 vision, but it has not. Instead, the level of cycling investment seems based on keeping the same level as before except when outside pressure is strong enough to force an increase. Whilst it is true that present funding levels are “at record levels” (£39.2m per year since 2014/15) this represents a mere 1.6% of the draft 17/18 Scottish transport budget. Indeed the whole transport budget could do with a fundamental re-assessment, based on maximising transport’s contribution to the government’s underlying objectives, including public health, climate, equalities, economy, etc. It would be lovely to think this might achieved via the government’s review of the National Transport Strategy – please send them your views!! In fact there are strong evidence-based reasons why 10% of the transport budget for active travel makes a great deal of sense. This is discussed in sections 6 and 2 of our pre-budget submission. [p19] 20mph policies. It is disappointing that the Scottish Government remains unwilling to set a default 20mph limit (with powers to excempt specified roads) in urban areas. Nonetheless, the strong support for 20mph in other respects is welcome. only one or two of the CL+ proposals can actually be built – yet even the shortlist for this year has 10 excellent projects bidding for the cash. [p7,15,16] Trunk Road Cycling Initiative. It is great to see this 20-year-old policy being ‘refreshed,’ as we have long urged [e.g. our 2015 le tter; govt reply]. The wording in CAPS3 is more restrictive than we would like, referring only to including cycling in trunk road upgrades, but it needs also to cover cycling schemes where the trunk road itself is not being upgraded. [p18] Bike/rail on West Highland Line. We are pleased to see that last year’s furore over the planned big cuts to bookable bike spaces has resulted in what appears to be a significant multi-organisation collaboration to improve the situation. [p31] Glasgow Tradeston segregated cycleroute. 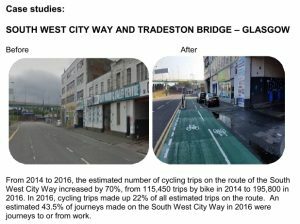 CAPS3 includes some interesting case studies, including the above which helps confound any sceptics who think that segregated main road cycleroutes might not work in Scotland! Spokes strongly supports the government’s wish for 10% of all trips to be by bike – and we do all we can to encourage that locally through our volunteer efforts – lobbying, producing and distributing fantastic bike maps, holding stalls at festivals, and in many more ways. However it is time the government acknowledged that given the levels of funding it has allocated up to now, and continues to allocate (1.6% of the draft 17/18 transport budget, down from 1.8% this year) there is zero prospect of reaching the 10% vision by 2020. What is more, CAPS3 [page 7] suggests that the government intends no increase until 2021 at the soonest – it refers to £280m for the 7 years from 2014/15, which implies maintaining the current £39m/£40m per year throughout this Parliament. We were amazed therefore that the 2015 SNP Holyrood manifesto expressed “determination” to achieve 10% cycle use by 2020 – without any increase in funding – and now the Minister’s introduction to CAPS3 promises an “unshakeable commitment“ – again without any increase in funding. At current investment levels, cycle use is rising only very slowly, forming roughly 1.2% of all trips in 2015 [Scottish Household Survey] and only somewhat better for work trips [CAPS p23]. Spokes has estimated that if the Scottish Government raised cycling investment to European levels of £20 per person per year (i.e. 5% of the transport budget for cycling, or 10% for active travel as a whole) then a realistic though very ambitious evidence-based target would be 10% of all trips by bike by the year 2027, or the round figure of 15% of all trips by bike by year 2030. See full details in our pre-budget submission [section 3]. For a fuller understanding of the issues, read our pre-budget submission.